Amboseli Cyclists and Thrill-seekers Safari! You must be a member of the Nairobi Cyclists and Thrillseekers Group to attend this activity. Would you like to join this group? 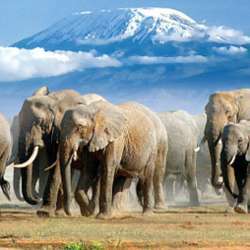 The name "Amboseli" comes from a Maasai word meaning "salty dust", and it is one of the best places in Africa to view large herds of elephants up close. Other attraction of the park includes opportunities to meet the Maasai people and also offers spectacular views of Mount Kilimanjaro, the highest free-standing mountain in the world. It is located 4hrs drive from Nairobi near Oloitoktok. Teule Kenya is a nonprofit, non-governmental organization registered in March Protected content give a safe secure home for kids in Kenya that are abandoned, orphaned, abused or neglected. The rescue center gives shelter to Protected content are in primary school or younger. The secondary school kids attend boarding schools then go back to the home during holidays / breaks. Already the home has assisted more than Protected content . We will be staying at a guest house in the children home grounds that can sleep up to 6 people. If we are more than this number, there is a nearby cottage that we can stay at. Food and clean water will be provided. We will have a view of Mt. Kilimanjaro from our rooms! 	We will leave Nairobi at 7am Saturday 2nd March Protected content , heading to Oloitoktok where we will spend at the nonprofit Teule Guest House. Protected content following Sunday morning on 3rd March Protected content , we will have an early breakfast and head out to Amboseli with our packed lunches. 	We will then head back at 3pm to arrive in Nairobi at 7pm. DAY ONE: DRIVE FROM NAIROBI TO OLOITOKTOK! We will head to Oloitoktok near the Kenya-Tanzania border from Nairobi at 7am to arrive at around 11am in time for lunch with the kids prepared by chefs at the guest house. We will visit the school and deliver our food and nonfood donations. We will bring our bikes from Nairobi (either hired or own). At around 3pm we will head out to cycle. We will see hills and small valleys on the sides of Mt Kilimanjaro. We will find a small border town called Kilomberu on the border of Kenya and Tanzania with lots of wooden areas and good mountain bike murrum paths. This is a total of 20km from the guest house. There is great views of the mountain and the Chyulu Hills in the distant horizon. We won’t need any travel documents getting into TZ, since we are only zipping in and out back into Kenya; which is allowed by the border patrol. Dinner will be served and we can relax by a campfire before bed. The day will be spent exploring the park with an early morning game drive at Protected content that will extend into the afternoon. This is so that we leave for Nairobi at 3pm. Nature lovers can explore different habitats here ranging from the drying up bed of Lake Amboseli, wetlands with Sulphur springs, the savanna and woodlands. The park is home to herds of the African elephant, Gazelles, Zebras, Wildebeests, Maasai Giraffes and on a lucky day Lions and Cheetahs among others. Then we will head back to Nairobi. Sunscreen, hats, sun glasses, Camera/Go-pro, binoculars, Swimming suit, Warm clothes, comfortable shoes, sandals, toothpaste, Towel and long trousers and sleeves preferably made of natural fibers. Carry change of clothes and personal effects. If you have anything you would like to donate to these kids, eg books, clothes, food etc kindly bring them. Otherwise we can pool money and shop for some items when we meet. The list of what to buy will be provided from Teule so that we are relevant. Contact me for any assistance/enquiries. Thanks.